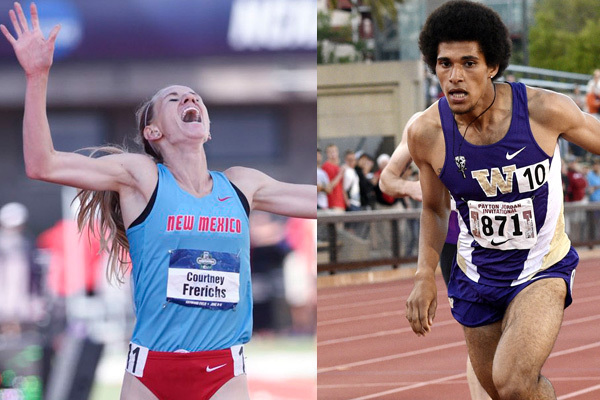 We’re pleased to welcome 2016 NCAA steeplechase champion Courtney Frerichs and NCAA 1500-meter runner-up Izaic Yorks to the KIMbia family of athletes. Both have just finished stellar college careers and will now work to make their mark as professionals. On Saturday, in her last race for the University of New Mexico, Courtney ran 9:24.41 to not only win the NCAA title but break the NCAA record in the 3,000-meter steeplechase. The old mark of 9:25.54 was held by Jenny Barringer (now Simpson), a former U.S. record holder in the event. Courtney is now the sixth fastest American steepler in history. Courtney is currently third on this year’s U.S. steeple list. She’ll return to the site of Saturday’s victory, Hayward Field in Eugene, Oregon, to run next month’s Olympic Trials. On Friday, Izaic closed out his college career by running 3:38.06 to place second in the 1500. In February, the University of Washington star ran an indoor 3:53.89 mile, the fastest ever by a U.S. collegian. Last month Izaic beat a field of pros at the Payton Jordan Invitational to win the 1500 in a personal best of 3:37.74. Izaic will also run the Olympic Trials next month. Stay tuned for details on Courtney’s and Izaic’s pro plans, including where they’ll be training.